Krush Groove Wednesday Night at Schlafly Bottleworks – Strange Brew! Rick: That guy was a sucker, man. Carmen, file this. Rick: Damn. Take all my money out of that bank. Carmen: We don't have an account. The story deals with a number of rap artists Run DMC, Kurtis Blow and the Fat boys in their efforts to make it big as hip hop stars. 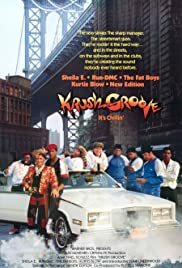 It deals with the good and bad of having a hit record on a small independent record label, competition between two brothers over the heart of a young female singer (Sheila E.), the consequences of borrowing money from a loan shark, the opportunity to sign with a major label and a talent contest looking for new hip hop talent. The contest includes an appearance from New Edition, an all too brief appearance from future superstars The Beastie Boys and an in studio audition from LL Cool J. The film was rated `R' generally for some mild violence and usage of the `F' word. (Six instances where two would automatically mean an `R' rating) It didn't do too hot at the box office. I had stated that the film came out a year or so too early. The reason I stated this was that in 1986, one year following this film's release, Run DMC's cover of Aerosmith's Walk This Way got heavy airplay on white radio, even going to number1 on album rock radio in Aerosmith's homebase of Boston MA. This success opened the door for The Beastie Boys, The Fat Boys, LL Cool J, Will Smith (known at that time as The Fresh Prince) and a large number of other hip hop and rap artists to score BIG on the Pop singles and pop album charts.